At Fullerton House School we believe that learning opportunities occur throughout the day in all settings and in a unique way for each individual. The young people we support at Fullerton House School have complex needs and very specific barriers to learning and as a result require a structured programme that sets out a predictable yet challenging routine for the day. However, it is also important that the learning opportunities offered are flexible enough to meet the young person’s changing needs at the time. The teachers, tutors and teaching assistants working at Fullerton House School are trained to support and deliver the programmes in this creative, responsive way. Responsive and creative learning activities giving opportunities for both individual and small group learning. Our curriculum aims to develop successful, confident and responsible young people and combines individualised learning programmes and recognised, strategic frameworks and agendas to address the complex needs of each young person at Fullerton House School. It also pays due regard to elements of numerous nationally recognised schemes including ASDAN, entry level 1, foundation learning (The National Curriculum) across the range of learning from P level to NC levels. Overall we aim to improve levels of participation and achievement, ultimately supporting the young person's progression through work and life. Young people at Fullerton House School are placed in registration groups according to preferred learning styles and their very specific needs. We target these needs in our Curriculum Framework via designated learning environments and teaching bases that include sensory focus areas through to specialised workshops for those following vocational programmes. With time and careful monitoring the young person’s programme develops to encompass a needs-led responsive pathway of learning, whether focused on personal and social skills or actual supported employment. Schemes of work, derived mainly from the National Curriculum, form a cyclical rotation of modules that, alongside our tailored bespoke programmes, make up the longer- and medium term-planning cycle. Together with the national statutory expectations these elements combine to create our highly individualised Curriculum Framework. When a young person is referred to Fullerton House School, an ILP is created with step-by-step targets to enable successes to be celebrated early and often. This plan is used to carefully tailor experiences to suit each student and encourage enhanced thinking skills and an enjoyment of the learning experience. Young people follow their identified pathway which, where appropriate, is linked to the National Curriculum at Key Stages 2, 3 4 and 5. Everyone also has the opportunity to participate in work-related learning and citizenship. We take account of community cohesion and British values locally, regionally, nationally and internationally within the curriculum. Key skills are intrinsically built into the curriculum and are an essential basis of everyone’s development. These key skills may include: communication, application of number, information communication technology, working with others, problem solving and improving own learning and performance. Fullerton House School provides a range of qualifications linked to each young person’s pathways for learning. Young people will from time to time be offered the opportunity to take part in learning experiences in the local and wider community. A successful external learning experience can greatly enhance the school curriculum and help motivate the young people we support and staff. By strictly following regulatory guidance we aim to ensure things do not go wrong and pitfalls are avoided. This will involve thorough risk assessments in relation to individual young people and their specific needs, staffing, travel arrangements and the site to be visited. Fullerton House School follows Department for Education guidance in relation to educational visits. Achievements are recognised and acknowledged on a daily basis. Progress is monitored through the formal assessment process, and equally importantly, successes are celebrated by friends, staff and family. A list of awards and qualifications gained during the previous school year is available from the school on request. Everyone receives appropriate instruction in religious education in line with the syllabus. To make the lessons more relevant and accessible they are adapted to meet the social, moral, spiritual and cultural needs of those with learning disabilities, which may be severe. All staff and people we support participate in collective worship at least once a week in line with their cultural needs, which provides a celebratory focus. Assemblies also offer a mixture of comparative cultures, topical and secular themes. They are designed to reflect and celebrate the multi-faith culture that exists in Britain today. Religious and cultural issues are considered in respect of each individual. Each student is taught through a bespoke package, created according to their individual needs. Our teachers, clinicians and support staff are trained to adapt the national curriculum to meet the needs of our students. 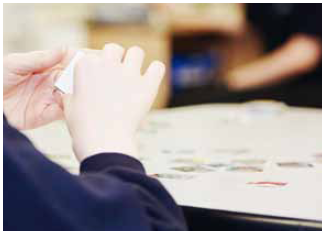 In addition, staff are trained to deliver SEN specific approaches including TEACCH and ABA. Teaching – sharing autism knowledge and increasing the skill level of professionals and practitioners. Expanding – increasing own knowledge to provide high-quality services to young people on the autism spectrum and their families. Appreciating – appreciating the strengths and uniqueness of autistic culture. Collaborating and Cooperating – with colleagues, other professionals, young people on the autism spectrum and their families. Holistic – adopting a holistic approach, looking at the young person, their family and community. One of the strengths of ABA for children with autism is that it can address every behaviour relevant to that child (both excesses and deficits). As a result, ABA can be used to help with anything from treating eating disorders to traffic control. Behaviour analysts examine the causes and the consequences of behaviour. From their assessment they then develop interventions and teaching programs for classroom staff to lead. The research shows that ABA is most effective for children with autism when used intensively (30-40 hours per week). With this in mind, students at Fullerton House who are assessed as likely to benefit from ABA have their own class where the ABA approach determines the structure of the day and the support they receive. Behind, this our approach to delivering ABA is fun and students receiving this provision have it presented in a personalised and enjoyable manner and also enjoy a full range of enrichment activities and opportunities to learn outside of the classroom. Details of our Terms and Student Holiday Schedule are available below or by requesting a copy from the school. Exclusions are very rare. The school has an Exclusion of Students and Termination of Placement policy. The policy is only used in extreme circumstances, and generally when all other options have proved unsuccessful. During the previous academic year there were no fixed-term or permanent exclusions from the school.